Thanksgiving might be over now, but that doesn’t mean pizza’s any less appealing. 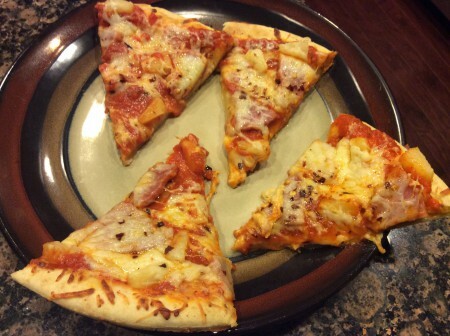 Instead of picking up the phone or reheating some more turkey leftovers, make your own easy, healthier ham and pineapple pizza using my recipe below. Sean and I have tried lots of pizza places around Atlanta – heck, we even had pizza one night in Shanghai, but time and again, I find myself drawn back to making my own pizza… up to a certain point. I don’t necessarily need to make the dough from scratch, or the sauce, but it’s so satisfying to know the pizza’s been made exactly to our specifications (not to mention a heck of a lot healthier). So below is my version of ham and pineapple pizza. If you’re not a mention of ham (or pineapple) or anything else on the pizza, for that matter, feel free to sub in your own ingredients on top of the pizza crust and sauce. This is a great base for just about anything you care to place on top though. Enjoy and let me know your favorite pizza toppings! Lay pizza crust on baking sheet with tinfoil underneath or a pizza stone. Spread 1/3 to 1/2 of a jar of pizza sauce of choice on the pizza crust spreading evenly almost to the edges. Chop ham into chunks and sprinkle on top of pizza sauce. Also layer in crushed pineapple bits at this time. Top the whole pizza with shredded cheese. Bake in the oven for 8 – 10 minutes, turning on the broiler for the last minute to brown up the cheese. Remove the pizza from the oven, sprinkle red pepper flakes over it for an extra dash of flavor, slice into 8 pieces and enjoy. Just look at those delicious slices of pizza goodness. So much better than takeout!